On Saturday March 28th in Ukrainian city of Cherkassy «K2 East Promotions», promotional company of Klitschko brothers, carried out a big professional boxing tournament which got the name «Tornado 2». In the main event WBA intercontinental middleweight champ Avtandil Khurtsidze (18-1-2, 11 KOs), a Ukraine based Georgian, faced very strong opposition fighting former IBO light middleweight titlist Attila «Viper» Kovacs (25-3-0, 17 КОs). Judges had quite a difficult task in determining the victor since both fighters did not waste a single moment and furiously attacked each other from the initial bell. It was a competitive fight all the way with Khurtsidze just slightly busier. After twelve action packed rounds which thousands of fans in Budivelnik Sports Palace in Cherkassy welcomed so much judges finally gave majority nod to Khurtsidze: 115-113, 116-112, and 114-114. After this win it is expected that Khurtsidze will join top 5 in WBA rankings. On the undercard 25-year old Croatian Mario Preskar (15-0-2, 10 KOs), a hot heavyweight prospect and latest newcomer to «K2 East Promotions» made his successful debut under new colors by early stoppage of Zurab Noniashvili (11-5-1, 6 KOs). In fact, Preskar, a regular sparring partner of Klischko brothers in recent times, found no opposition in Noniashvili who was surprisingly passive and remained sitting on his stool after the third round. Another «K2 East» prospect undefeated welterweight Dmitrij Nikulin (17-0, 6 KOs) smartly outboxed Mikheil Khucishvili (11-6-2, 4 KOs) on the outside. Nikulin gradually increased his pressure to which his opponent had nothing to answer with. When the fight turned into lopsided beating and Khucishvili’s face started to bleed profusely his corner decided not to take the risk any longer and after round 7 requested to stop the fight. Khucishvili retired in corner after round 7. Noniashvili retired in corner after round 3. 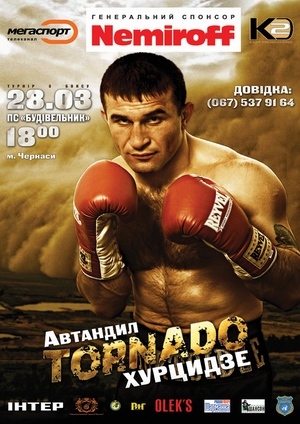 «Tornado 2»: presser in Cherkassy! On March 17th in Cherkassy prefight presser was held in advance of «Tornado 2» boxing tournament which «K2 East Promotions» promotional company will carry out at Budivelnik Sports Palace on March 28th in that Ukrainian city. General manager of K2 East Promotions Alexander Krasyuk introduced the tournament to the journalists.